I am lucky to live in Victoria, BC and work at UVIC. I have met some wonderful people on and off campus. I have been involved with Ladies Learning Code Victoria (#yyj) Chapter as a volunteer, learner, and sponsor. And, here I am again at an event. This weekend’s event is a Python session. We have approximately 40 learners here and a mentor at each pod. The energy in the room is amazing. My favorite part, though, is the introduction of the mentors. Every mentor is either affiliated with UVIC or is a local business worker/owner who wants to see more women working as a programmer or developer. It’s quite breathtaking to meet the students involved with the Women in Computer Science and Engineering members. The learners vary in age from 15 – retired. This time the session was held in one of our Active Learning Classrooms. The room is set up with the instructor in the center, and the students in pods. The set up requires lots of interaction between the students, and the instructor. I am happy to share that the attendees were blown away with the room. I do not feel smug, but rather like I am seeing the consequences of months of hard work by the leadership of the local Ladies Learning Code chapter, and the Classroom Infrastructure Committee at UVIC. OK, I take it back, maybe I feel just a little smug. Smug, and very happy. Whenever I can see some active learning taking place, I feel a sense of pride. And, here I am witnessing the magic take place, as one of our undergrads leads the session. Yes, she’s teaching the session and doing an amazing job. Ladies Learning Code does a great job connecting our students and the local community. I have attended all six of the Social Media Camps held in Victoria, BC. Each one has had some special highlights for me and the 2015 camp is no different. 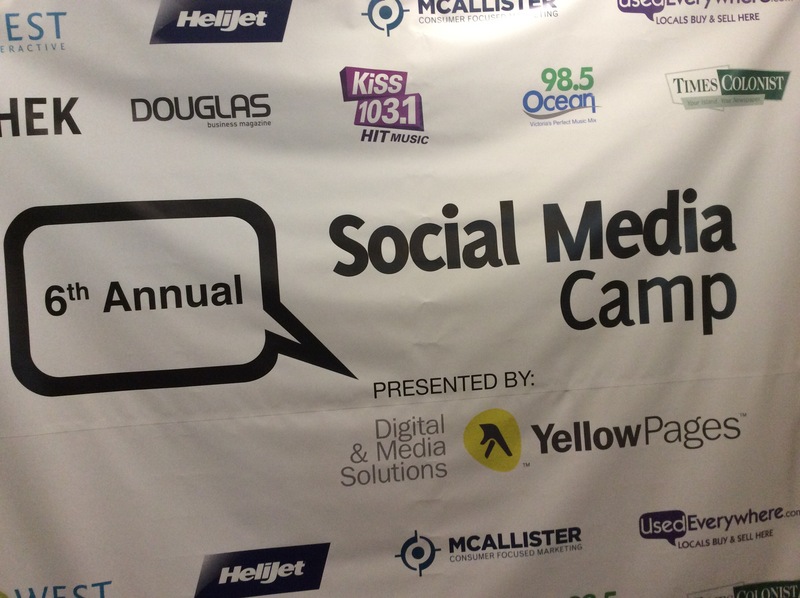 Social Media Camp is nerd-prom for those of us heavily engaged in social media at work or for our personal lives. And, Social Media Camp Victoria is apparently one of the largest of its kind. My takeaways for this year vary from engagement, it is about the people, and your story counts. I have made some great connections, met some finally in real life (IRL), and have seen old friends/former students. The camp experience was great. Let me get to the takeaways more carefully. Social Media is not social if you do not engage with people and make an effort to connect and have conversations. Communication is not one way and when it is one way you can expect to get dropped, muted or blocked on the particular platform. You want to be authentic on your platform(s) and not just push out information. You need to think about your story and your purpose. What are you doing? Plan your posts. This is different than scheduling. Be thoughtful and you, and be careful. As I always say, if you pause before you submit or click–you might not want to share that post, joke or photo. You also want to think about what you are sharing. Are your posts and photos thoughtful. What are you trying to get across? And, are you posting or responding to something when you are tired, frustrated or angry. Posts can live. You might delete or rethink something, but it is too late. Practice safe social media! I have more to say about Social Media Camp 2015. #smc #smc2015 But these are my raw thoughts post lunch on day two. I attended my third Word Camp in Victoria AKA #yyj this past weekend. It was another great event, where I learned lots about Word Press and the various functions of the platform. More importantly though, I got to see some of my students in action, as we sat on a panel together about blogging. I’m so impressed with these students and others and just want to send positive energy out there to: Renae Sinclair, Adrienne Sanders, and Alannah James. I’ve placed them in the order of our presentations. Way to go! If you haven’t had the opportunity to attend a Word Camp, I would suggest that you do or look for a Word Press Meet up in your region. It’s good to bounce ideas off of others and to also hear about the plug ins that are tested or the favorites of the more advanced users. I’m really lucky to live in a tech saturated city–another name for Victoria is Tectoria. And, this May Social Media Camp will take place. Check it out! It’s been more than a week and I am still processing the magic behind the Breathe Now ( #breatheyyj ) conference that I co-cordinated with Angela Rafuse-Tahir, Janice Mansfield, and Yukari Peerless. We wanted to organize a conference that we wanted to attend in Victoria. Between the four of us we have attended business women conferences, social media conference, academic conferences, BlogHer, Blissdom, and other work-related conferences. We wanted something completely different that spoke to women’s need to balance work and life and remembering to take time out for yourself and breathe. The conference was a resounding success from head to toe. The energy was pulsating at the various panels and workshops that the 100 delegates attended. I saw lots of smiles, tears, and heads nodding during the presentations. A common theme throughout the weekend was that it’s important to have balance in our lives. Many women spoke to how imbalance led to different types of crises and the need to reflect and reboot life. I was pleasantly surprised to hear repeated speakers talk about how important therapy, exercise, sleep, eating right, and taking time out for oneself was crucial to mental health and overall physical well-being. When the conference ended, I got sentimental and felt a little sad that the weekend was ending, but so many great connections were made. I’m thankful for all the emails, coffee dates, and tweets that I’ve read since the conference. I learned lots about myself, my friends, and the various speakers. Our choice of keynote speakers was perfect, too. Rona Maynard and Bif Naked both spoke their truths and offered the delegates a chance for important reflection. We all left the conference energized and ready for everything and anything. I look forward to chatting with my friends about Breathe Now 2013! It’s OK to be a Woman in a Man’s World! #Breatheyyj Really looking forward to this preso! Participants are: Marisa Goodwin @organicfoodme Anya Sereda @tinybean and Katie McDonald. What a great panel of woman who are working in male dominated fields. I just want to add that a great majority of the #BreatheNow meetings were held at Discovery Coffee, which Anya Sereda works for as their Green Bean Sourceress! Sereda speaks to the coffee industry and refers to the baristas–the boys–as the show ponies, while the women are more apt to manage! It’s really interesting to hear about how so many coffee farms owned by women in the countries that she’s visited, but men run the farms. Interesting. I love that she admits to looking young. She’s 26 and looks like she’s 20. (Her words). She has a passion for beans, for coffee. And, after listening to her preso, she really knows coffee! Her job sounds amazing. Out in the field doing her work… She noticed the ways that some people have treated her due to the issue of her youth and gender. She acknowledges her strengths and knowledge in the field and how it can at times be difficult for people to take her seriously. Happy sigh that my teen is here listening to this and hope it’s insightful to her and the rest of us in the audience. The next speaker, Marissa Goodwin, reflected on her experience with her business Organicfair and the farm that she and her family run! She shared compelling stories about the level of sexism within the industry. We have more work to do! Looking at her bio it’s nice to see that their company includes 99% women employees. They are making change day to day in their work and their philosophy. Organicfair is based in Cobble Hill not too far from the Greater Victoria Region. Overall, Goodwin is another trailblazer! You, go! The last speaker Katie McDonald is a mixologist who works at Veneto Tapa Lounge in Hotel Rialto. She has avoided thinking about being female in her career. She knows it’s there. “This elephant in the room.” I have to say that this is really common with lots of women—ignoring gender. But, she notes that we do need to think about gender. I like that she brought up equality and difference. Oh, those debates have not been resolved years later. Really? Some men call themselves, “Cocktailologist.” OK. She says that she’s a Mixologist or Bartender. Interesting that for every one resume from a woman they field twenty resumes from men. And, this quote below also speaks to another binary in the job or industry. These quotes are telling. I’ll say it again and again: we have more work to do. She’s right, it’s an idealist view if we insist on saying that we’re all just people. This erases different components of identity. I do think that at times when people say this they are coming from a place of privilege and do not think that any difference exist at all. Again, this is in some instances and not meant as a sweeping generalization. And, McDonald notes that she wants to be just another Bartender and not the fact that she’s the “best woman bartender on the island.” On the flip side, she likes seeing women at competitions so that more women can/will attend these competitions. She’s sharing some honest, good points in her preso. I’m really enjoying the frank anecdotes. I’m sharing my almost live tweets about Rona Maynard’s keynote today at #Breatheyyj. @ronamaynard Wow, great preso. Any keynote coach would say: Brava! #Breatheyyj Thinking about her comments about resentment. She grew up in alcoholic household, but on the outside everything looked fine. Maynard knew that she wanted more–a different type of life. Trailblazer. She was part of the generation who was trying to do it all. Remember she was the Editor in Chief of Chatelaine. But, it was hard to do it all–hard to keep balance. Lots of head nodding in the room, as she shared these points. We think we have to be Super Women. This can be an issue in a hostile work environment. We will burnout. We will get sick or worse. Maynard left one job and worked at home and slipped into a depression. “With trembling fingers I made the call to a women’s mental health clinic.” I’m glad that she’s sharing this story with us today. We need to get rid of the stigma about mental illness, as it is so common. This is really hard to do. People expect us to say yes. Oh, this is important to me right now. I’ve recently said no to a few things and stood my ground much to the surprise of those around me. I said no to protect myself and my integrity and refused to get bullied. Back to Maynard, I really want to read her book, My Mother’s Daughter: A Memoir. I want to read her life story, as I think I have something to learn from her. Her preso is reminding me that I’m not alone in parenting a teen. You do have to pick your battles. You do have to call a truce on certain issues with your teen. Boom. Thinking maybe a family meeting is in order to chat about things. Maynard’s speech is making me think of so many things. Maynard shared that her articles led women to write her letters. She was motivating them. It’s refreshing to hear that she made a difference in so many women’s lives. I am impressed. What a perfect fit for @BreatheNow. I am so proud of the team of co-founders, sponsors, and volunteers in making this possible. This is our little slice of community building in Victoria #yyj. I really love her comments about resentment. Makes me think of the resentment olympics. It’s important to protect your time, so that you don’t feel resentful. You need to keep the well-spring full. We need certain mantras to stay happy. It’s work. Can’t say, “Accio balance. Accio happiness.” You have to work on it and keep your boundaries in order to do it. And, I will be honest, I do keep the positive emails and when I need to–I will review them. It’s grounding after a tough day. Thank you, Rona for giving me food for thought.